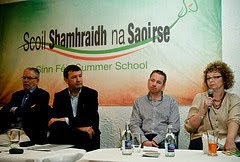 This year sees the second of Sinn Féin’s summer schools. For those who don’t know there are many of these across the state during the summer months. They are organised by a wide range of groups and cover topics as diverse as literature, music, culture, politics, writing and much more. Most last a weekend. This blog has spoken at several over the years. But last year Sinn Fein held its first such school in west Cork and this year we have returned for a second time. 'Scoil Shamhraidh na Saoirse’ is taking place in Baile Bhuirne in West Cork. The summer school has a wide range of speakers on politics, the economy, sports, language and arts. The partys website www.sinnfein.ie is carrying regular updates throughout the weekend. Among the topics being covered is the 1981 hunger strike which took place 30 years ago this year. Danny Morrison, Leo Green and Sean Kelleher are addressing that issue. This morning there was a informed and very discussion on the ‘need for a new Revival’. The main contributors to that were the north’s Minister of Culture Carál Ní Chuilín, Robert Ballagh, Jimmy Barry Murphy and Adrian Breathnach and beginning soon after my keynote speech will be a debate on ‘Dealing with the debt crisis – Progressive Alternatives’. Contributors to this include Pearse Doherty TD – Sinn Fein Finance spokesperson, Huginn Freyr Thorsteinsson - Political Advisor to the Finance Minister of Iceland, Yanis Varoufackis - Professor of Economics University of Athens, Tom McDonnell – Policy Analyst TASC, Mary Smithwick - Assistant News Editor and Political Editor for the Evening Echo and Jack O’Connor - General President of SIPTU. Frankie Gallagher (loyalist politician and chief spokesman for the UDA linked Ulster Political Research Group) also this morning on the issue of loyalism. I used my remarks to speak on the need for a new Republic for the 21st century which is relevant for today and which reflects the views and opinions citizens across this island. Sinn Féin’s goal is a new republic for the 21st century that encompasses all the people of this island. Already there are many, including business leaders and some unionists in the north, who understand the economic value of building the all-Ireland economy. In my view Ireland can be changed. But citizens need to be clear about the kind of new Ireland we want to create. That needs a national debate. If we are to renew and revitalise and construct a new Ireland – a new Republic – it has to be relevant for citizens today. It must reflect the views and opinions of all our citizens; whether they are urban or rural; nationalist or unionist or republican or none; of all or no religion; young or old; disabled or from our new immigrants, and it needs to reach out to the diaspora. In respect of unionists it is important that we engage with them in seeking to create a new republic. It must be one in which they are comfortable. The construction of a new national democracy on the island of Ireland must involve reconciliation between orange and green. Nationalists and republicans must reach out to unionists and engage with them on the type of Ireland we want to create. Our responsibility is to ensure that unionists are comfortable and feel secure in a new Ireland. It has to be their Ireland also. So it must be a shared Ireland, an integrated Ireland, an Ireland in which unionists have equal ownership. That means republicans seeking to understand what unionists mean by Britishness. It means being prepared to seriously examine forms of institutional and constitutional arrangements and structures which may be different from those normally advanced by republicans. It means seeking to convince unionists that in a new Republic they would be citizens, not mere subjects, and entitled to rights not concessions. Key to this is building an equal society, one in which equality is at its core. The fact is that equality makes sense. Inequality costs society more. The elimination of inequality is not only possible, it is critically important, not least because it allows for the full mobilisation of the available creative human resources. For example, a person who cannot walk is not unequal because he or she uses a wheelchair, but because most buildings (including workplaces and schools) and transportation are designed in a way that excludes people who use wheelchairs. It takes only a few adjustments to allow for universal access. This principle applies more broadly. We are not inherently unequal. It is exclusive social and other structures that make us unequal. We can choose, either to perpetuate and reinforce these structures, or to change them to make them more inclusive. Just as inequality is socially constructed, it can also be dismantled. As a consequence, building an equal society is possible because it is a matter of public choice. Finally, we need to appreciate that Ireland today is a country in transition. There have been many positive developments in both states on the island. A lot of the old certainties have gone. A lot of the old conservative influences have been weakened. A lot of unfinished business still has to be completed, but progress has been made. If is also a fact that Ireland is still partitioned and there is poverty and unemployment, and there are profound issues which need to be resolved between unionism and the rest of us. But no one should minimise how much our society has changed, particularly in this last forty years or so. Sinn Féin’s goal is an Ireland built on positive change, on equality, on partnership. An Ireland where the wealth is invested creatively and more fairly and where our children wake up in homes that are warm. An Ireland in which our schools are properly resourced and where no one waits for a hospital bed, a home or a job. The resources exist to build this republic – the new Ireland. What is needed is political will and vision. We are inviting others to join us in this historic endeavour. Wonderful Gerry, "New Republic" of change. To to reach the vast middle joined the new Republican. A good invocation of a “new birth of freedom" from the old to the new. You seem more the power then other time . The individual had possessed in the Irish significant and true self. This is a Proclamation and most pointedly juxtaposed. A new Ireland a new nation, a Republic newly conceived. This a more perfect state to come. A speech well delivered a speech well composed.